The versatile and dependable MAKO® 204 CC is ready for everything from patrolling the beaches to targeting sailfish. The aggressive Deep V hull slices through choppy seas, and the hull/deck joint is chemically bonded and mechanically fastened with stainless steel fasteners every 6"—it's truly built stronger than it has to be. 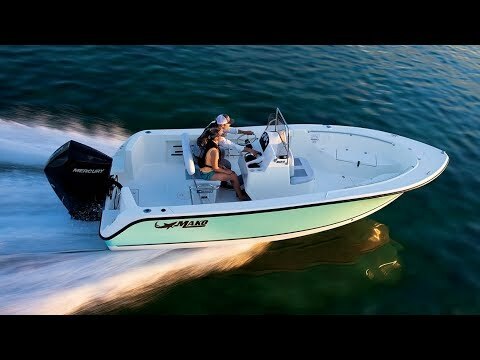 Besides being a superior offshore fishing machine, the 204 CC features bow seating at port and starboard with fishboxes beneath, a forward-console cushioned seat with a 21-gallon baitwell beneath, and a large in-floor storage compartment—making it perfectly welcoming for both fishermen and families. Max. person weight: 1450 lbs. Average hull weight: 2000 lbs. Average package weight: 3435 lbs. Package height w/T-top or hardtop: 10' 1"